Birds need water every day, even when all the water is frozen. They can get it from snow or food such as insects and wild fruits. But they appreciate open, available water. Especially when ponds and streams are frozen. They will seek it out if it's available. And that's an opportunity for backyard bird watchers. My favorites are birdbaths with heating elements built into the bowl, like the Kozy Spa bath at right. I have found that this kind of heating system is the easiest to keep clean, full, and unfrozen. In extremely cold weather, some ice may form around the edges, but there always seem to be some open water at least in the middle. And the birds go right for it. This one is nice because the cord is concealed in the pedestal. If there is not much danger from cats, you can use a ground level birdbath. Some birds prefer a low birdbath. The Four-Season Bath is pretty nice after a snowstorm, when it's completely concealed by snow except for the open water. The heater is built in to the underside of the bath. Click the picture (taken in my back yard) to see what the birdbath looks like when it's not covered in snow. The advantages of built-in heater include the fact that the heater cannot fall out of the bath and let the water freeze. If you already have a birdbath that you like, but it doesn't keep the water from freezing in winter, you can add a de-icer, a heating element that sits down in the basin. It's not quite as convenient as a bath with a built-in heater, but it is an economical way to tranform your present bath into something that will function in winter. The best ones are thermostatically controlled, so the heat is on only when necessary to keep the water from freezing. 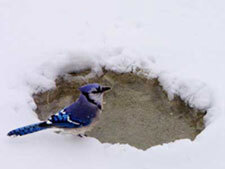 Where should a winter birdbath be located? Not under the feeders. Seeds and droppings soil the water quickly. So don't locate the bath too close to the feeders. Where there's an escape route. It's great to put your birdbath under some branches that hang down to two or three feet from the bath. A wet bird can flutter up to the relative safety of the branches. Within reach of an electric outlet. If your bath freezes over, you're missing half the fun. 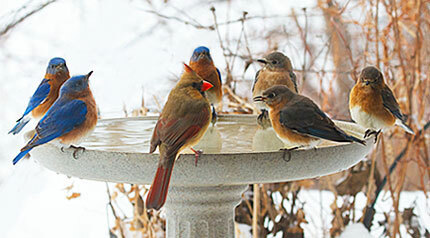 Offer unfrozen water in subfreezing temperatures, and you'll have lots of bird visitors. A birdbath doesn't need a pedestal, but there are some advantages. It's safer from predators. It's easy to see from the house, and it's easy to clean. Cats like to lie in wait beneath shrubbery or behind a concealing object and then pounce on the birds when they're wet and can't fly well. So put your birdbath at least five to ten feet from such hiding places. Give your birds a chance to see the cat coming. Within reach of a hose. 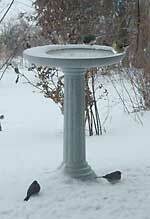 Make your birdbath easy to clean and refill. If you live where it's warm enough that you can use your hose in winter, put the feeder where the hose reaches. In view from your window. Put yourself in the picture. Place the birdbath where you can see it from your desk, dining room, or kitchen sink.